Lynn Kurtts has been to 65 Elton John concerts and has met him in person on four separate occasions. Journal photos by Ingrid Howard. Back in the ‘70s, when Lynn Thomas was a student at Homewood High School, she could buy a record with $5 that she made from babysitting. When she spent her babysitting money on Elton John’s 1974 album Caribou, it changed her life. She already was familiar with two of the singles on the album from listening to John on her car radio. Forty years later, her name has changed to Lynn Kurtts, but she still calls herself Elton John’s number one fan. She’s been to 65 Elton John concerts and has met him in person on four separate occasions. 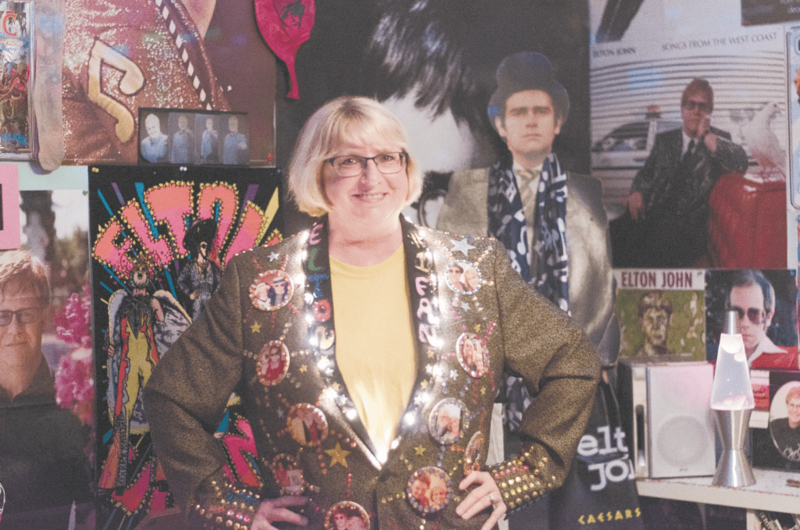 All of these memories and more are documented in her “Elton John Room,” a ‘70s-themed spot downstairs in her Hoover home with disco balls, lava lamps, bean bag chairs and hundreds of Elton John memorabilia. The walls of the room are blue, but almost every inch is covered with an Elton John poster or photograph. Five of the framed photographs picture Lynn with John. There are concert ticket stubs, Elton John dolls, a pair of John’s sunglasses that Lynn won at an auction and a 25-pound scrapbook filled with magazine and news clippings. Lynn said she began decorating the room after her daughter moved out about 10 years ago. Her husband, Rob, had built the bedroom for their daughter. Meanwhile, all of Lynn’s Elton John memorabilia had been in storage boxes. When her husband said that was OK, she took out a few posters to hang up, but she quickly realized that she couldn’t pick a few favorites. “I had so much, I couldn’t say, ‘Well do I want to put up this poster or just that one?’” she said. Instead, she had enough to fill up a whole room. So that’s what she did. Since then, Lynn said, she has added a lot to her collection. But a lot of what’s displayed in the room is from her original collection. After all of her encounters with John, Lynn said she thinks he may know there’s a big fan of his in Alabama. At a concert in 2007, she and Rob scored front-row seats to one of his shows after Lynn answered a trivia question correctly on the radio. “So we were on the front row, and he comes out on stage, and he’s taking bows,” she said. Lynn hasn’t had a chance to meet John in person since then, so she still doesn’t quite know what that means. All of the photos with John and the band are documented on her homemade, bedazzled jacket. On the right side of the jacket are five smaller versions of her photos with John. On the left side are photos with the rest of the band. By pressing a button on the inside of the jacket, Lynn can turn on the lights that travel up the seam. She made the jacket specifically for John’s upcoming visit to Birmingham, which is part of his last tour before retiring. “I decided that if Elton’s going to go out with a bang, then I’m going to go out with a bang, too,” she said. Lynn plans on putting a Kleenex in the pocket of her jacket for this last show, she said. John’s final Birmingham concert will be at the BJCC on Dec. 4. Lynn wasn’t able to get front row seats this time, but she’ll be on the 12th row, sparkling in her light-up jacket with Rob.